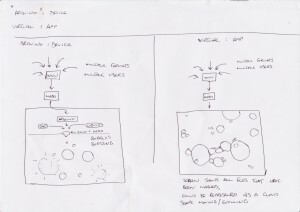 The sketch shows two diagrams each visualising the data being destroyed. Both root from the same source – a webpage which allows multiple-users to upload any file format. These files are either broken down into a ‘wave-form’ of binary which is used as the source from which the visualisation is taken, or else simply the size and date (or other easily accessible data) is taken from the file to inform the visualisation process. 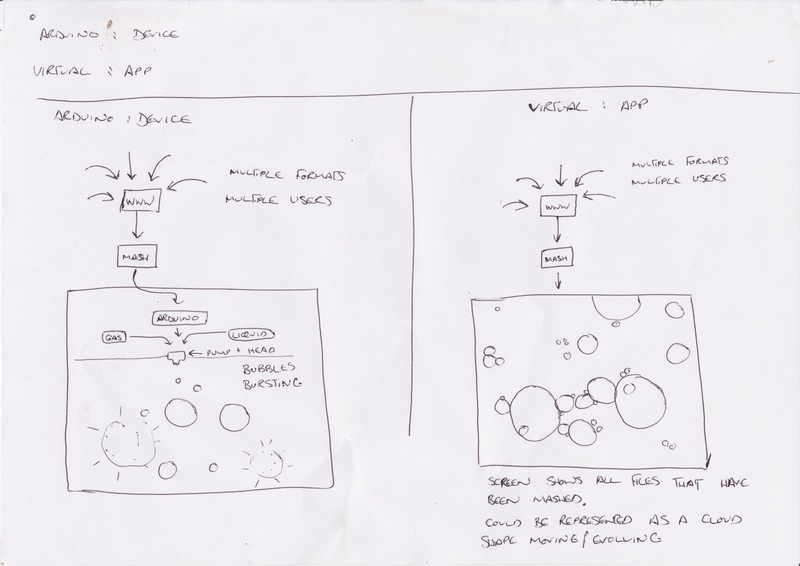 The two routes visualise the data in different but related ways – both use bubbles which can be said to represent the cloud. This cloud like aspect can be increased or reduced depending on what is finally decided to be important. The real-world example shows an arduino receiving data from the webpage – this data controls the flow of gas (helium?) and liquid (some bubble-making liquid) through a motorised valve-head. Basically the larger the files the larger the bubbles made. Once the bubble has been made the data is removed from the database, and from that second on only remains as an entity until the bubble bursts. The online example shows a similar idea but is represented through coding. People can view the webpage so see what files are currently being uploaded / bursting. Perhaps some ghost of the orginal file could remain for people to interact with while the bubble still exists – e.g. on mouseover a faint image of the original source file could be seen within the bubble. Perhaps some bubbles could merge to form mega-bubbles that exists for brief moments before bursting. ← A more forgetful Facebook?